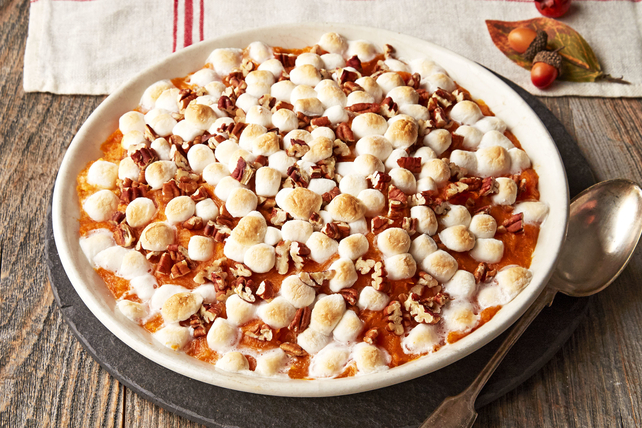 Enjoy this rich Maple-Sweet Potato Casserole recipe tonight. The perfect side dish, our Maple-Sweet Potato Casserole can also be prepped ahead of time for added convenience. Prick potatoes with fork; place in single layer on microwaveable plate. Microwave on HIGH 12 to 14 min. or tender. Cool slightly. Peel potatoes. Place potatoes in large bowl. Add butter, milk and syrup; mash to desired consistency. Stir in seasonings. Spoon into 1-1/2-L casserole dish sprayed with cooking spray. Bake 30 min. or until heated through. Top with marshmallows and nuts. Bake 7 to 9 min. or until marshmallows are slightly puffed and golden brown. This delicious side casserole can be assembled ahead of time. Mix potato mixture, then spoon into prepared casserole dish as directed. Refrigerate up to 2 days. When ready to serve, bake in 350ºF oven 30 to 35 min. or until heated through. Top with marshmallows and nuts; continue as directed.